Every year, thousands of individuals sit in the Rhode Island jail not for crimes, but because they owe money to the state. Court debt is the most common reason that people are put in jail in Rhode Island--about 2,500 times a year. This incarceration is unnecessary and overly hasty, is an inefficient use of state finances, and disrupts peoples' lives. Rhode Island's system of court debt is considerably more punitive, more costly to defendants, and less accomodating to indigent individuals than other New England states. OpenDoors encourages policymakers to end the incarceration of the poor for inability to pay court fines. * The most common reason people in RI are put in jail is court debt--17% of all jailings and almost 2,500 incidents a year. 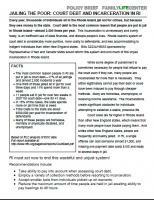 • Take ability to pay into account when assessing court debt. • Employ a variety of collection methods before resorting to incarceration. • Accept smaller bails from individuals picked up on warrants. Ricardo was incarcerated for 40 days in early 2007 because of court debt. He was held for a bail of 745 dollars, and because of being imprisoned he lost his job. Ricardo's unnecessary incarceration cost the state of Rhode Island $4,000. Harold is a veteran and on SSI currently because of his cancer and heart problems. Despite his current health problems, Harold is doing well, although previously he has struggled with substance abuse problems, homelessness, and related legal problems. Throughout his life he has been incarcerated many times for court debt, most recently in 2005 for ten days.